Although the first steps of the gambling history go back to the prehistoric times, the evolution of casinos in the way we know them now started much later. 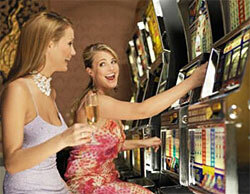 You can watch a video poker guide and get to know everything about poker and history of this popular game. And what about casino itself? The word "casino" itself takes its origins from Italian "casa" ("house") and gained the further meaning "a place for entertainment", a bit later, although it didn't only include gambling in the beginning, but listening to music, for instance, as well. It was also Italy, which saw the appearance of the first traditional land casino in the 17th century, when "Ridotto" was opened publicly in Venice with the aim of taking carnival gambling under government's control. Despite their European origin, the crucial steps of the casinos' development are certainly connected with the USA, where the so-called saloons turned out to be their forerunners. Those were mainly spread in 4 biggest trading centres, such as St. Louis, San Francisco, Chicago and New Orleans, and, primarily, weren't designed in a special way. Though, later, at the further stages of the development, one could easily distinguish the stirring casino building from the others. Think the great difference from that times to the actual ones, where you can play online without leaving your living-room, we now have sites that are available for all UK at your home 24/7 from your personal computer or your mobile device. Nevertheless, the beginning of the 20th century wasn't remarkably successful for American land casinos, as gambling became forbidden according to federal laws. Still, the situation changed for better in 1931, when casinos were officially declared legal in the state of Nevada, since when Las Vegas has become the main gambling city in the USA, saving the encouraging 2nd place for Atlantic City (New Jersey). In the 60s - 70s Las Vegas has become the embodiment of 1st-class entertainment, as the land casino buildings had exclusive design, and a great number of movie-stars and other celebrities, including Frank Sinatra, for example, attended parties, held in them. The only thing, spoiling the picture, was a somewhat notorious fame, gained much due to the association of the gambling business with the Mafia. Undoubtedly, modern land casinos have become even more imposing and unique in their entity, providing clients with a great diversity of gambling games, such as numerous blackjack variations, baccarat, video poker, different kinds of roulette and slot machines, so that no one leaves the casino unsatisfied. At the same time, there has recently taken place an enormous leap in the evolution of online casinos, which tend to provide almost the same variety of gambling games, as the land ones, and therefore, become more popular among people.